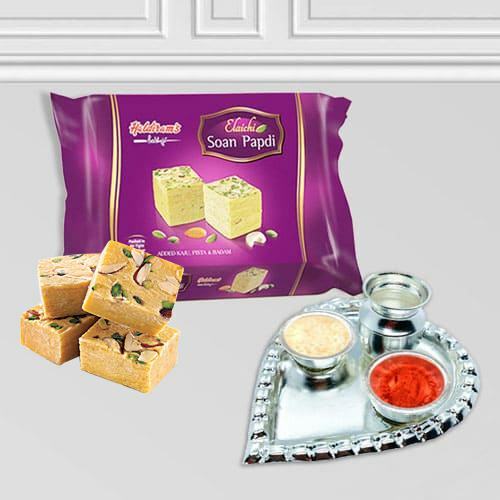 Silver Plated Paan Shaped Puja Aarti Thali (weight 52 gms) with Soan Papdi 400 Grms. (Gross Weight) from Haldiram. Flowers Delivery Noida, Send sweets Margao, Wedding Cake Rourkella, Diwali Mithai Bhopal, Send Flowers and Gifts to Gandhinagar, Online Shop Durg, Flower to Warangal, New Year Flowers Miraz , Fresh Fruits Aurangabad, Send Gift Ratnagiri, Dry Fruits to Chennai, Birthday Delivery Shillong, Sending to Sawai Madhopur, Flower shop Ambala, Ranchi Online Cake Delivery.